The last ship to be built for the Union Steam Ship Company, Saxon was a product of Harland & Wolff, Belfast. She was launched in December 1899, but was transferred to the newly-created Union-Castle Line before she was completed. 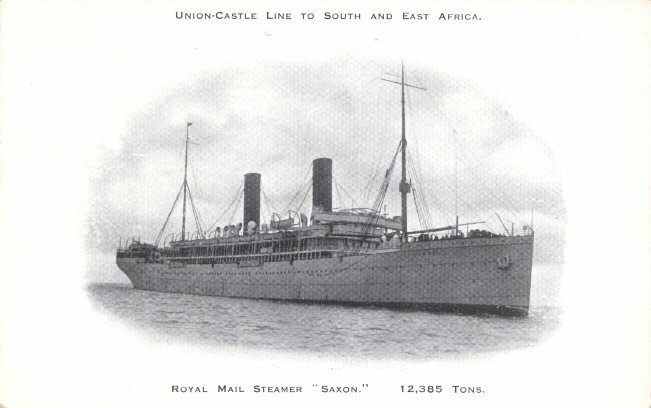 Saxon became the first ship to begin her career with Union-Castle, making her maiden voyage on the line's mail service from Southampton to Cape Town on 16 June 1900. On that voyage, Saxon was painted in Union livery, but sported Union-Castle funnels. At her first repainting, however, she was given Union-Castle's distinctive lavender hull. Saxon resumed her Union-Castle service in 1919, and remained on the mail service through 1930. She made her final sailing on the intermediate service in January 1931 and was then laid up as a "reserve" ship. She was scrapped at Blyth in 1935, the last survivor of the Union Line fleet. Sources: Haws' Merchant Fleets; Kludas' Great Passenger Ships of the World; Mallett's The Union-Castle Line; Dunn's Ships of the Union-Castle Line.